We were tasked with designing a set of communications tools which Expedia could use to get their team excited about the move to a brand new Seattle campus, and to help them to understand how the agile workplace principles could make their work life easier and more enjoyable. Expedia had commissioned Scott Brownrigg to help to design their new 5000 staff campus in Seattle following a multifunctional and fully agile model. We worked with their Design Strategy Unit to redesign their worker profiler app to analyse the functional and emotional requirements of the workforce and match those needs with a range of worksettings and features within a flexible and agile workplace redesign. We created a range of “avatars” for their staff, based on traveller types, with each avatar corresponding to a particular worker profile. 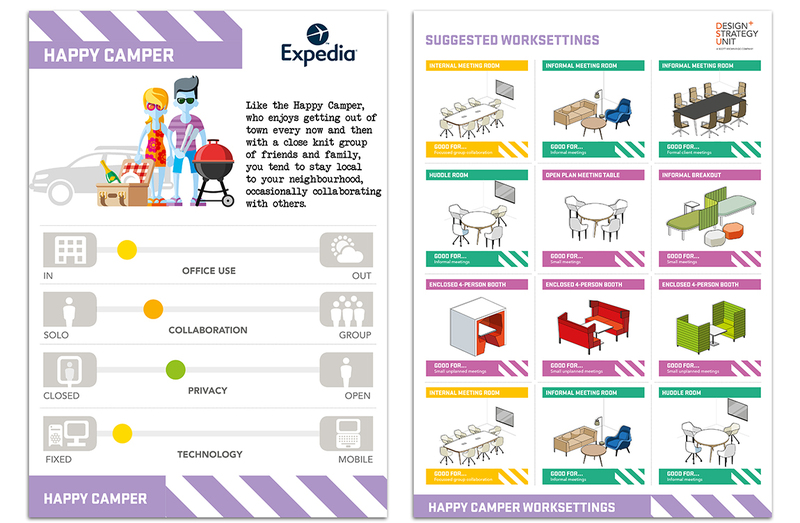 The avatars were used at the Expedia Discovery Fair to help the staff understand the choices available to them in terms of worksettings, and the flexibility that the new campus design could offer them. Participants at the fair were issued luggage tags which relate to the profile created by looking at their every day working practices. They were then invited to identify which worksettings they thought would be of most help to the way that they work. The tools we created allowed the work team to feed back to the Expedia management about their reactions to the agile campus worksettings in a way that was engaging and felt relevant to them. The results of the profiler app questionnaire combined with the feedback from the Discovery Fair were compiled and we created a reporting system delivered digitally and in printed formats.